We lost a wonderful neighbor, a most remarkable person. Evelyn Frankovich, the mom of that person riding with me in the harper-Collins video, also named evelyn. lively, giving, sparkling. 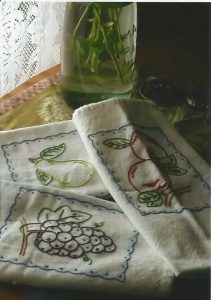 a few days before we lost her she drove up to my house and presented me with some beautiful hand-embroidered towels, and said, ‘that’s to say thank you for being a friend to my daughter’. I was astonished and gratified, amazed. we talked for a while and she told me about her life, growing up in Galveston. Difficult circumstances, and yet always so cheerful and laughing. I asked her what she did when she did embroidery work and mentioned that when I did my repair sewing, I listened to radio — classical station at 88.3. She said, ‘I pray for people’. three days later the lifelift helicopter came over my ridge and down the other side and it was with great trepidation I saw it land on Evelyn and Pat’s property. Half the population of seco ridge road was on the way down there including me in my golf cart and I was praying it wasn’t for any of their people. Isn’t that selfish? because it sure as hell had to be somebody. we are but human. It was a heart attack, she was airlifted to San Antonio and in three days she was lost to us. But not really. Evelyn Junior gave me a CD with photos of her but I can’t get it to load or work and so I am thinking she’s saying. ‘Not now. Maybe later’. Ok Ev, whatever you think. Keep praying for us. 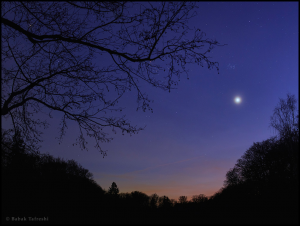 Venus is the evening star now, I have never seen it so bright.